Jay Davison not only volunteers in this garden, he and his wife Terry (not pictured) recently donated funds to help in this garden’s renovation. Stacey Parker (right) oversees the maintenance of this landscape and has been instrumental in orchestrating its recent renewal. Recent rains have calmed our drought anxiety and those whose lawns have greened up again may be reprioritizing their one-time thoughts of landscape renovations. However, regardless of your situation, there’s a place in the UC Davis Arboretum you should visit now that may make your gardening decisions easier — the Mary Wattis Brown Garden of California Native Plants. Think you are already familiar with this place? Look again. Its recent renovations, improved interpretative signage and hidden areas to explore beneficial wildlife make this garden worthy of multiple visits. That’s what friends Mary Major and garden namesake Mary Wattis Brown would want. 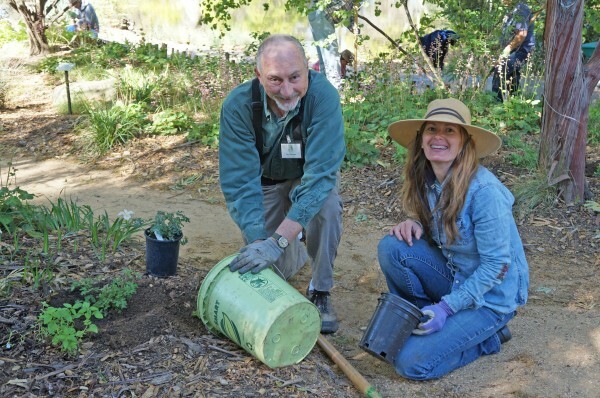 A local and loyal Arboretum volunteer and member of the Arboretum’s support group, Major supported the implementation of this garden’s California native concept back in the 1970s, then chose to name it in honor of close family friend Mary Wattis Brown, an avid gardener and botanist. Both Marys recognized the need for education to promote the conservation of California’s wild heritage in our home landscapes. Thankfully, since then it’s been the Brown family, other Arboretum donors and a loyal group of volunteers who continue to support its care and development. “This garden is in a great location, all along the south side of Lake Spafford. Hundreds a day stroll by but probably don’t truly experience the value of what is happening here,” says Stacey Parker, UC Davis Arboretum and Public Garden GATEways horticulturist, who has been lovingly maintaining and renewing this area for the past couple of years. 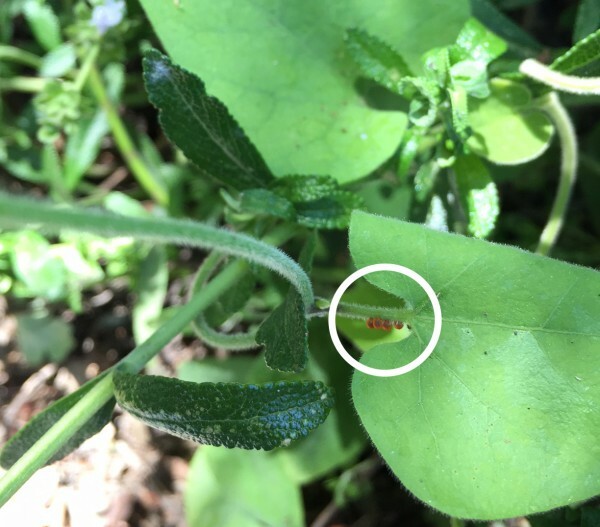 Spring is when our California pipevine provides a home and food source for pipevine swallowtail eggs and caterpillars which eventually morph into pipevine swallowtail butterflies. Pipevine plays an important role in this beneficial pollinator’s lifecycle. Although Parker claims she is still learning what blooms when, the waves of color and texture one notices with frequent visits say otherwise. The blooms of the California lilac fade just as the silver lupine send up their showy blue, conical flowers. Those blossoms turn to seed in time for the foothill penstemon to reveal its stems of densely packed purple buds not to mention the poppies! Then there are the sages, buckwheats, fuchsias … the list goes on. But there’s more to experience here than a well-conducted symphony of California native plants. Follow these tips for exploring the garden and discover what you may have been missing. Crouch down and study the California pipevine. You’ll see patches of it lining Lake Spafford but be careful not to disturb any tiny rust-color eggs or the medieval-looking black caterpillars munching away on its leaves. Those will morph into fluttering pipevine swallowtail butterflies that then drink the nectar of nearby native sages. Take a seat on the bench under one of the oldest trees in the garden, the Catalina cherry tree; you’ll see a plaque. It happens to be dedicated to Jack Major, Mary Major’s husband and beloved UC Davis professor of plant ecology. Now listen to the din of bees gathering nectar from the thousands billowy yellow blossoms above. 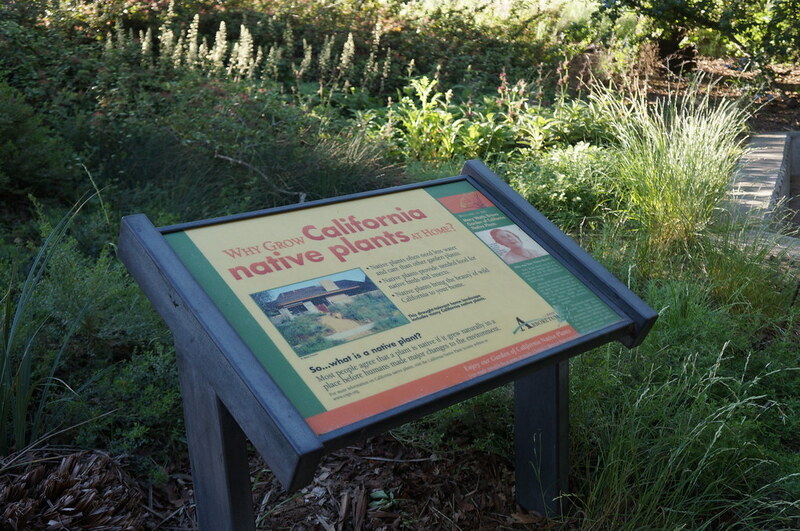 Familiarize yourself with the benefits of gardening with California natives by reading the freshly refurbished signage. Many feature Arboretum All-Stars, plants tested by Arboretum horticulturists and found to be attractive, reliable and low-water. Lastly, come back as often as you can to gain a more in-depth appreciation for its seasonal changes. The Mary Wattis Brown Garden of California Native Plants, along with the entire UCD Arboretum, is open to the public 24 hours a day. This garden extends along the south side of Lake Spafford from Wyatt Deck all the way to Mrak Drive and all along Arboretum Drive. Many of the natives grown here also will be available at the Friends of the UC Davis Arboretum and Public Garden plant sale on Saturday.